Gaming Headset for PC, Mac, PS4 & Xbox One G4ME ONE Black The preferred headset for professional gamers throughout the world. German-engineered speaker technology and a top-notch noise-cancelling microphone deliver outstanding hi-fi performance that let you focus on the game, not your headset. FOR USAGE WITH XBOX ONE AND PS4 PCV 05 IS REQUIRED (SOLD SEPARATELY) Overview Feel the rush, the beats, the tension and the awesome sound. Not your headset. The Sennheis..
Gaming Headset for PC, Mac, PS4 & Xbox One G4ME ONE white The preferred headset for professional gamers throughout the world. German-engineered speaker technology and a top-notch noise-cancelling microphone deliver outstanding hi-fi performance that let you focus on the game, not your headset. FOR USAGE WITH XBOX ONE AND PS4 PCV 05 IS REQUIRED (SOLD SEPARATELY) ~~Overview Feel the rush, the beats, the tension and the awesome sound. Not your headset. 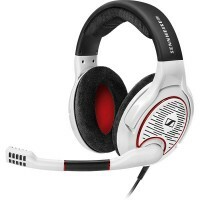 The Sennhe..
Multi-Platform Gaming Headset U 320 Whether you’re gaming on your PC, Mac, Xbox 360®, Xbox One®, PS3® or PS4® this multi-platform gaming headset ensures that you’ll have Sennheiser’s trademark superb sound across the board. Bring the game to life with punchy bass boosts that make car crashes and explosions more realistic than ever. 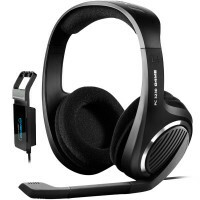 Overview of the U 320 Gaming Headset A headful of thrills If you game on more than one device or just want the perfect overall gaming headset, then t.. 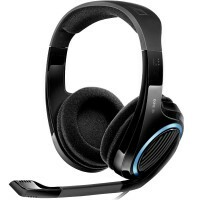 Surround Sound PC Gaming Headset PC 323D With realistic 7.1-channel audio powered by cutting-edge Dolby® technologies, this surround sound headset is a gaming must-have. Open-acoustic designed ear-cups are ideal for long gaming sessions and the pro-noise cancelling microphone ensures crystal clear conversations with teammates. Sennheiser quality speakers deliver great acoustic performance. 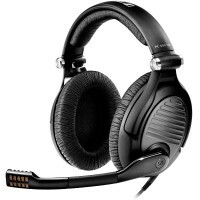 The pro noise-canceling microphone ensures crystal-clear conversations with ..
Gaming Headset for PC, Mac, PS4 & Xbox One PC 360 The preferred headset for professional gamers throughout the world. German-engineered speaker technology and a top-notch noise-cancelling microphone deliver outstanding hi-fi performance that let you focus on the game, not your headset. 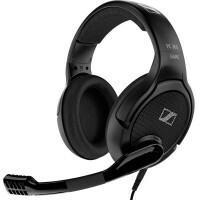 High-end, around-the-ear headset Sennheiser’s “Eargonomic Acoustic Refinement” technology gives outstanding sonic accuracy and clarity Ultra-comfortable XXL velvet ear pads and a cushione.. 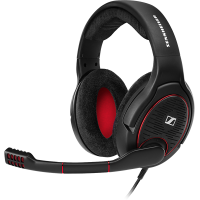 Featuring Sennheiser’s “Ergonomic Acoustic Refinement” technology, the PC 350 Special Edition 2015 delivers the ultimate in sonic accuracy and clarity. The updated closed design provided by the custom-made aluminum ear-cups lets you hear even the faintest detail of your game. Trimmed to positional accuracy The sound of the PC 350 Special Edition Noise Blocking gaming headset has been specially developed to provide an extremely ‘game realistic’ soundscape. This is achieved by reproducing hi..